Well, when it comes to animal ads, this one tops the list. This dog became a rage amongst people and pug became the most bought dog during those times. The prices of pug soared high in the market and owning a pug became like a status symbol. 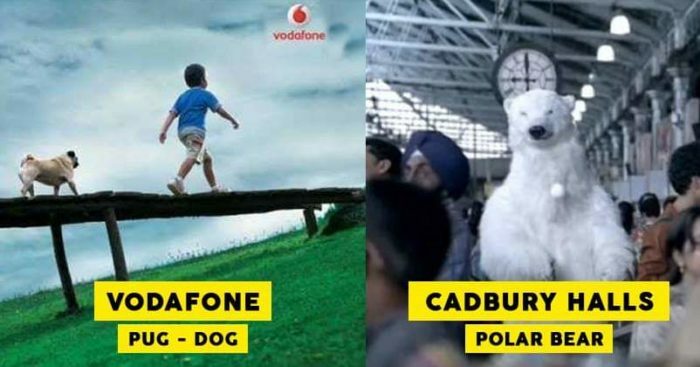 Vodafone’s association with this dog is remembered even know and it almost became synonym with the brand. Although an animated animal character, this one was hugely popular and even know people remember how exactly the bunny said “Lijjat Papad”. Loved by people of all age groups, this character too had developed a strong connection both with the brand and the audience. The advertisement came out at a time when animation was unheard of in Indian Advertising. This puppet by Ramdas Padhye has been the face of Lijjat for ages and this desi avatar of Bugs Bunny is a timeless classic. One funny commercial featuring the Indian team, this Pepsi ad was loved by many. The ad showcases the team practicing amidst a jungle and during the drinks break they see a lion sitting next to the Pepsi. Somehow Ganguly and Rahul Dravid bring the Pepsi case back just when Harbhajan drops a ball on Lion’s head. Which one makes for your favorite amongst these?